Optimum Nutrition Gold Standard Protein powder comes with 100% Whey protein. There are several brands Whey Proteins available in the market. But Gold Standard has abled to stand on the top of each. Millions of bodybuilder around the world have considered Optimum Nutrition Gold Standard 100% Whey Protein powder as their first option. This product not only helps shape your body but also burns your extra fats. But this protein powder doesn’t help to lower your mass. As per the name it suggests it contains 100% Whey Protein. But in reality, it contains more than 90% Whey Proteins and rests are of Carbs, fats and other ingredients. Glanbia is the parent company of Optimum Nutrition Inc. It is well known as one of the best cheese and nutritional ingredients company. Currently ON is operating two sports and bodybuilding nutrition brands such as American Body Building and Optimum Nutrition. These brands are providing nutritional supplements in the forms of tablet, capsule, powder and ready to drink. Glanbia first introduced Gold Standard 100% Whey Protein. This brand is very popular as it never provides artificial ingredients with its supplements. This product is considered as the signature product of Optimum Nutrition. Ingredients: Whey Protein Isolate, Whey Protein Concentrate, Whey Peptides), Sugar, Natural Flavor, Lecithin, Xanthan Gum, Rebaudioside A, and Lactase. This product comes with natural bodybuilding supplements. So it won’t have that much side effects as artificial supplements. Gold Standard 100% Whey Protein comes with pure protein. As the product contains a very low amount of fats, cholesterol, and lactose, it helps you build your body faster. You will get 24% protein while serving a scoop of this protein powder. The powder helps in building tissues in your body. When you will have this supplement, it will help you to gain stamina. Not only this but also it will protect you from many diseases. It eliminates the radicals from the body and enhances the bodybuilding immunity power. It also enhances the lubrication at all joints of the user’s body and offers you the perfect shape. Moreover, this Whey Protein helps you to repair your muscles as well as it forms new muscle cells. The basic component of protein is Amino acids. Our body is well enabled to break these Whey proteins into Amino acids. In comparison to other proteins, in Whey protein you can achieve your bodybuilding with perfect shape faster. Those who are looking for strong and huge muscles this Gold Standard Whey Protein is perfect for them. This protein consists of glutamine. This is the best class of Amino acids in the human body. Glutamine helps you to have perfect bend and shape of your muscles. This protein is double purified. So those who are looking for low fats supplements, this is perfect for them. How Much Does Gold Standard 100% Whey Cost? Gold Standard 100% Whey is a little more expensive than other similar nutritional supplements. One should take this Protein powder after consulting a fitness trainer and take doses as per suggestion. Those who are any medical treatment, they should not continue at that period. Pregnant women should not continue this during the whole pregnancy process. As this is very rich protein, some users may face difficulties in with the digestion. You may feel pain at your lower belly. It may make you suffer from gastric problems as well as loose motions or diarrhea. Where To Buy Gold Standard 100% Whey? Gold Standard 100% Whey can be ordered online from different places but our recommendation is to either buy it directly from the manufacturer or purchase it from trusted online retailers which may offer you discounts. 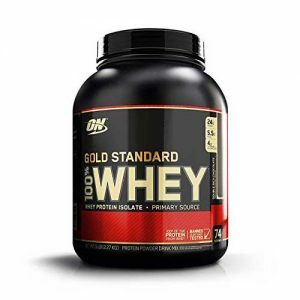 Gold Standard 100% Whey Review4.2DHMReviews2018-08-23 01:13:55Optimum Nutrition Gold Standard Protein powder comes with 100% Whey protein. There are several brands Whey Proteins available in the market….